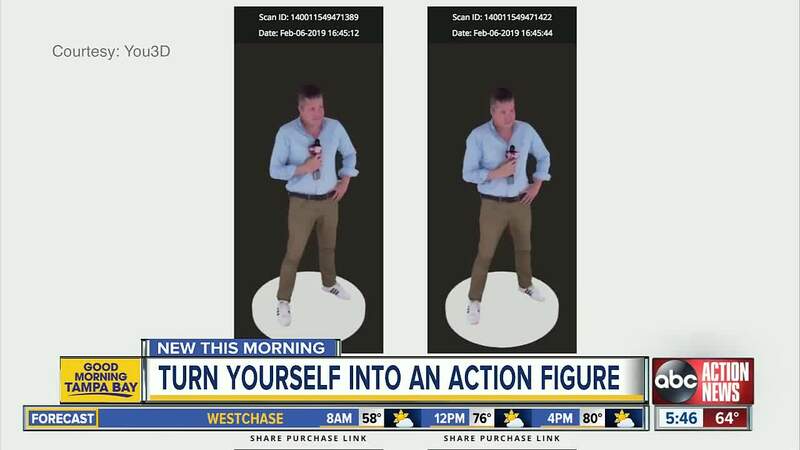 One of the attractions at the 2019 Florida State Fair is You3D, a booth allowing you to make a 3D selfie statue of yourself. TAMPA, Fla. — The 2019 Florida State Fair opens on Thursday. There are lots of new attractions to see this year. One of the weirdest new additions is You3D , a booth creating small lifelike figures of you, your friends, or even your pets. Balsamo proudly shows off his own mini-likeness, which is cozying up to his wife and his dog. The figures are made out of gypsum. Prices start at $35. You3D is a simple process that blends state-of-the-art 3D printing and photo technology. The first step is a cool 360-degree photo booth similar to one you might see on the Oscars red carpet. The booth uses 88 cameras and projectors to captures your 3D likeness. If you want your selfie statue, that takes money and time. It takes You3D about two weeks to make your mini-me. After it is created, the company will ship your figure to you through the mail. The You3D booth is located in the fair’s Expo Hall.